Pakistan born Usman T. Khawaja, Australia's opening batsman, responded to Indian team's jingoism with a maiden century that helped his team win the 3rd of 5 ODIs by 32 runs after losing first two ODIs. 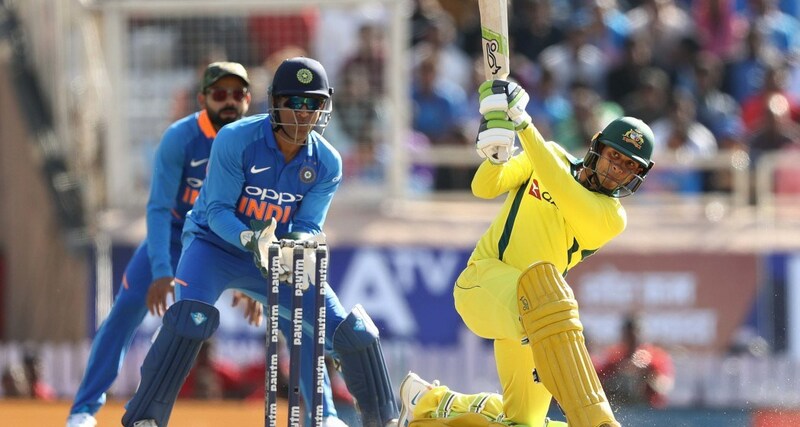 Khawaja then proceeded to score the series highest total score of 383 to help Australia win the remaining the remaining two ODIs and the series 3-2. Khawaja was named player of the match for 3rd and 5th ODIs. In an Op Ed for Huffpost, Indian journalist Binoo John summed up what happened in Ranchi in the following words: "No team in the history of modern cricket has worn military camouflage caps or symbols during an international match to make a statement". What happened in Ranchi is part of a pattern of Modi-led Indian hostile actions that include an almost total boycott of all cultural and sports exchanges that have historically helped lower tensions between the two South Asian neighbors. Pakistani artists are no welcome in India's entertainment industry. Pakistan players are banned from Indian cricket leagues. In February 2019, the International Olympic Committee decided to suspend all Indian applications to host future events and urged international sports federations not to stage competitions in the country after two Pakistanis were denied visas to compete in New Delhi. Hindu Nationalists, led by RSS Karsevak Modi and aided by the jingoistic Indian media, are radicalizing India's population by promoting hatred against minorities. Attacking Pakistan fits in well with the Hindu Nationalist Islamophobic narrative. Madhav Golwalkar, considered the founder of the Hindu Nationalist movement in India, saw Islam and Muslims as enemies. He said: “Ever since that evil day, when Moslems first landed in Hindusthan, right up to the present moment, the Hindu Nation has been gallantly fighting to shake off the despoilers". "Perched in privately funded think tanks, many of these connoisseurs of “surgical strikes” did not seem in the least shocked or disturbed that an Indian leader who has, as the Economist put it last week, “made a career of playing with fire” was now playing with Armageddon by launching airstrikes into Pakistan. Rather, they echoed the Hindu nationalist consensus that India was now finally dictating the terms of engagement with its rival — a triumphalism shattered the very next day when Pakistan raised its own threshold for conflict with India by striking within Indian territory and bringing down an Indian warplane. Eisenhower’s fear in 1961 of vested interests acquiring “unwarranted influence” is freshly pertinent in today’s New Delhi. With hopes rising that India would soon be a superpower closely allied to the U.S., as well as a strategic counterweight to China, much Indian and foreign money has gone into creating a luxurious ecosystem for strategic experts and foreign-policy analysts". Over the last two years, Pakistan has made serious strides towards bringing big cricket back to the country in a significant way. The PCB has successfully hosted various international teams over the last 20 months as well as the high-profile PSL. All this, according to the ICC's chief executive officer David Richardson, has "changed the perception" of Pakistan as a place to visit. International cricket in Pakistan came to an abrupt halt with the 2009 terror attack on Sri Lanka's team bus in Lahore, with Pakistan's national team finding a home away from home in the UAE. Since the visit of Zimbabwe in 2015, however, there has been a slow and steadily increasing flow of teams touring Pakistan. "I think they've done a tremendous job and the level of comfort is growing all the time among the foreign players," Richardson said, during Sunday's PSL final between Quetta Gladiators and Peshawar Zalmi in Karachi. "I know some security officials from Australia and other countries have come to see the matches here. Step by step, certainly, Pakistan is on the right path and I know that the PCB will be redoubling their efforts to encourage people and teams to come across and certainly it will be with the ICC's support." "Pakistan’s air space was locked down at that time and airports (in India) were also on high alert. No one knew for how long the uncertain situation will prevail. So, a consensus emerged that it’s best to shift the venue and India could host tournaments in future," a highly-placed source told PTI. India retaliated with an air strike, targeting a training camp of the outfit on February 26. Pakistan’s air space remains closed till date in the aftermath.